Hamas leader tells UN Middle East envoy to make Israel 'improve conditions' of security prisoners. Hamas leader Ismail Haniyeh said that the main subject of the meeting between the terrorist organization and UN Special Coordinator for the Middle East Peace Process Nickolay Mladenov was the treatment of Hamas members held in Israeli prisons. 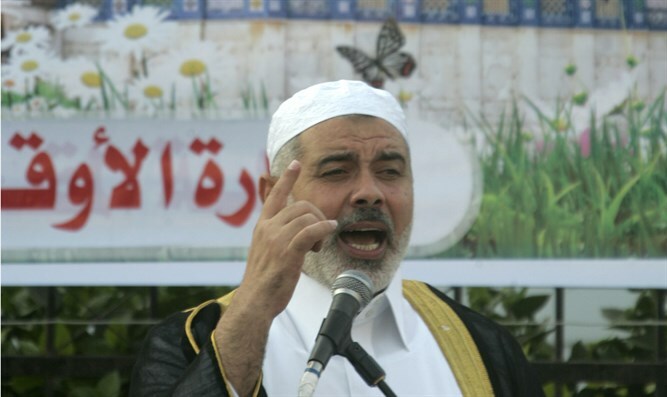 According to the Islamic Jihad-affiliated website PALTODAY, Haniyeh told Mladenov that there is a Palestinian Arab consensus on the issue of the security prisoners. In addition, letters were sent from the leadership of the security prisoners, in which the "grave situation" was noted in the prisons because of the measures taken against them. The Hamas leadership asked the UN Secretary-General's envoy to intervene immediately in order to stop the deterioration of the conditions of the security prisoners. On April 17 the Palestinians Arabs will mark "Palestinian Prisoner's Day." In the past this day was used as a pretex for confrontations with IDF forces at the points of friction.